HP EVA storage is a Hewlett-Packard storage product using the vRAID technology to combine disks into LUNs. Although the vRAID technology uses the common mirror, stripe, and parity techniques, the implementation (on-disk layout) of the technology significantly differs from the traditional RAID arrays. A HP EVA storage allows both fixed and thinly provisioned LUNs of vRAID0, vRAID1, vRAID5, and vRAID6 types. Since a typical HP EVA setup has several different LUNs created over all physical disks in the unit, the recovery is complicated by the number of disks – typically you have to deal with several dozens of them. 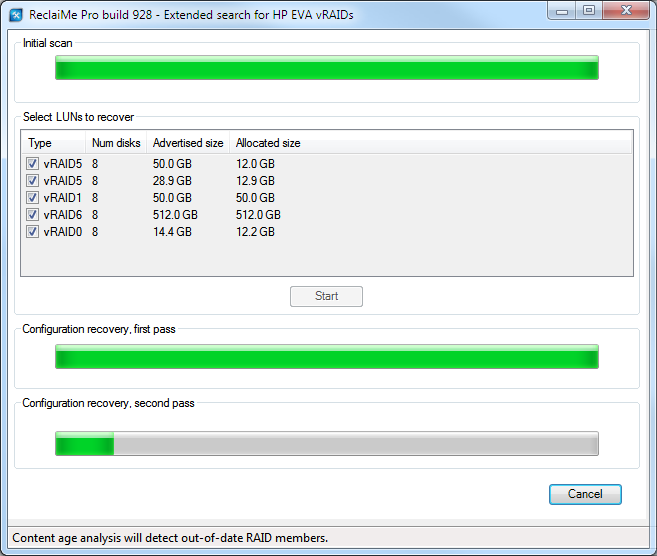 ReclaiMe Pro can reconstruct lost HP EVA LUNs over the disks coming from HP EVA storage units like HP EVA 6300 storage. For recovery, you need to connect and then select all the disks from the EVA unit in question and click the Find HP EVAs button. Based on the results of the preliminary analysis of the disk set, all possible HP EVA LUNs are displayed. Then you have to choose LUNs - you can select all LUNs needed at a time - you are interested in for the next recovery step. determining basic HP EVA configuration parameters like stripe size, disk order and other. Based on the parameters determined, rebuilding virtual HP EVA volumes. This function requires at least two disks selected. The recovery is impossible when only vRAID0 LUNs are selected. You need to have at least one mirror or parity based LUN in the set. Black - a healthy HP EVA LUN. Amber - HP EVA LUNs that have missing disks but can still be reconstructed by appropriate vRAID redundancy (mirror or parity). Red - HP EVA LUNs which are not readable because too many disks are missing. Due to the specifics of the vRAID technology, you can still try to recover data from such a LUN; however, only partial recovery is possible. Note that due to the nature of the vRAID technology, you may have many disks missing and still be capable of recovering data from HP EVA LUNs.